I've run out of original ideas to post. OOPS....wrong Norquist; meant JOHN "Dump all freeways" Norquist, not Grover. 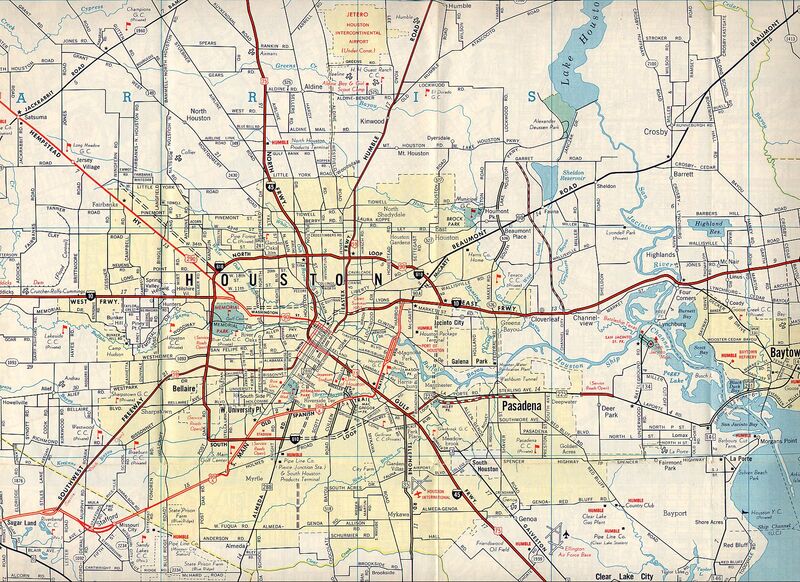 It certainly makes you wonder how far ahead they planned when the I-10/US 59 interchange was revamped. The Houston Business Journal is reporting strong support for the new downtown design from the downtown business community. This support is crucial because those interests have political influence. Strong support could also move it to construction sooner, especially with the likelihood of a substantial increase in TxDOT's budget. A plan to decommission a portion of I-45 running through downtown Houston could increase development and connectivity downtown, real estate experts say. A Texas Department of Transportation proposal to realign Interstate 45 downtown with Highway 59 would render the Pierce Elevated, a portion of I-45 that runs along Pierce Street through the central business district, unused. At a recent Urban Land Institute panel on downtown Houston, real estate experts were united in support of the plan to demolish or transform the Pierce Elevated. The group of panelists, representing various sectors of the real estate industry including office, multifamily and retail, all agreed that the plan would lessen or remove a barrier between areas of downtown that could result in improved connectivity and more development. "I couldn't be more enthusiastic about it," said Sanford Criner, vice chairman at CBRE with more than 40 years' experience with office leasing and development. "Mobility is always important, but our problem isn't getting people downtown, it's what can we do with them when they're here? Would TX DOT be able to leverage the increased value of the real estate to help pay for the highway improvements? I asked a representative at the public meeting about the realignment of US 59 on the northeast side of downtown. As you mention, that section of freeway is a distribution system into downtown, entirely elevated, with some impressive structures, completed around 2003. He told me that it is desirable to remove the curve in the existing alignment, and more significantly the realignment will make constructability much easier. He also said they already have approval to basically wipe out the Clayton Homes housing project. He said the housing project is susceptible to flooding and the residents will be relocated to new housing. I'm sure the downtown Houston real estate and business interests would love to see that low-income housing moved elsewhere, because having it removed will make the area much more attractive for redevelopment. And how much growth they had planned for as well. They know by now that their business-friendly and freedom-friendly environment has bolstered its population and traffic growth. This one project will probably cost more than La. DODT's entire annual budget. Greater Houston's GDP is twice as big as the state of Louisiana. And of course, such a mega project means that kind of money is spent over multiple years. So will the total length of I-45 change if and when the project is done? What I find very interesting is that this plan is being touted by the anti-road folks at Streetsblog and similar sites as being a positive in removing the Pierce elevated, while ignoring the fact that they are widening the other freeways to take over some of the loss of capacity. Do people here believe that this project will be an overall positive for the driving public? If any technically-oriented types out there want to review my list, I would be pleased to get some feedback to verify my concerns are valid. Personally, I think it would have been better if they didn't remove the Pierce Elevated, had dropped it in a trench and widened it to handle existing I-45 traffic, replaced the proposed managed lanes with regular free lanes, and used alternatives like expanded light rail corridors to handle the commuter traffic. I understand how downtown business leaders want to expand development, but this is sounding more like an expensive clusterwack more and more. Personally, I think it would have been better if they didn't remove the Pierce Elevated, had dropped it in a trench and widened it to handle existing I-45 traffic, replaced the proposed managed lanes with regular free lanes, and used alternatives like expanded light rail corridors to handle the commuter traffic.I understand how downtown business leaders want to expand development, but this is sounding more like an expensive clusterwack more and more. 1. There appears to be two primary practical concerns behind the removal of the Pierce. First, expansion of the existing deck is infeasible given the property values of the surrounding buildings. Furthermore, given the development of the surrounding neighborhood, such an expansion would likely fail a "highest, best use" test. The second practical concern is that trenching the Pierce would likely cost multiple billions for a single mile of roadway, due to takings and the difficulties of constructing a trenched roadway in dense, urbanized surroundings. Double-decking would likely be the most cost-effective way of expanding the Pierce, which is politically infeasible. 2. Light rail isn't designed to handle commuter traffic, and would not address the primary concerns with the Pierce, which is its failures in handling through traffic. You would need higher-speed commuter or interurban rail to address that, which is difficult in a sprawled, multinodal city like Houston. 3. Free lanes would be nice, but would have their own sets of problems (weaving, which is endemic in Houston) owing to the current funding environment, and TxDOT's aversion to creating divided express and local lanes. 4. Reconstruction of any freeway system in the center of a city will be an expensive cluster unless corners are cut, like they were for the first Pierce reconstruction. Does anyone know how much this "massive, mind-boggling" rebuild is going to cost? Or how long it will take to complete the projects? My guess is 6.5 to 7.5 billion dollars. Plus 5 to 8 years giving the fact that they would need to do the I69/US59/I45 section first to allow traffic to still move. Then the revamp/deconstruction of the Peirce section. Plus, city is still trying to bring in events like the Superbowl, World Cup, and Wresltemania, which a project like that makes those bids next to impossible to achieve. The Houston Chronicle reported on the current status of the project. TxDOT posted the latest design schematics on the project web site in May and I updated my analysis of the project design. The good news is that TxDOT has fixed several serious issues with the new update. My list of design concerns is now only four items, and TxDOT says it is studying the problems to identify changes to address three of the four remaining concerns. I express my concerns about the mind-boggling $4 billion cost of the downtown work, and my view that current funding levels cannot complete the entire downtown plan in a reasonable amount of time. When was the I-10/59 (now I-69) interchange redone? Five or seven years ago? And it will be replaced in five to seven years? Amazing. I'm amazed how fast the decision-making process is in this case. In most areas such a very large project would require decades of political indecisiveness and shifting priorities before it gets built with a reduced scope. This project hardly appeared on the radar until 2015, right? I'm no highway engineer, but the way Houston floods, it surprises me to see plans for more trenching of highways. Flooded freeways hold water that would otherwise sit in neighborhoods. Any expansion of impervious surface requires a retention offset, and trenching freeways provides much of that retention. Ah, the light dawns. Thank you. Not only am I interested with DFW's projects, but I'm interested with what Houston can do. I just haven't really spoke much about them, but this is of real interest. I'm actually ok with the Pierce Elevated being demolished, because that is a bottleneck at 6 lanes while the other side is 8 lanes. Hoo boy. When I drove through Houston in November it didn't seem like it was that bad in the downtown area. I was stuck in a traffic jam because of an incident that closed every lane, except for the far right lane. Besides that traffic seemed to move pretty well, which surprised me since it is the 4th largest city in the US. If you really wanted to avoid the downtown area you could take I-610. The only reason I didn't take I-610 is because I like to drive to drive right through the middle of huge cities.